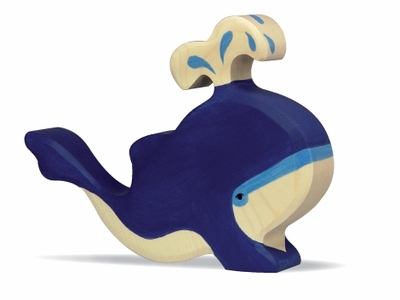 PADiLLY.com - beautifully handcrafted wooden whale at the online toy store. Holztiger 3550 - Sturdy figure made from solid hardwood. All surfaces and edges are sanded to a very smooth finish, then hand-painted with nontoxic, waterbased paints and sealed with a nontoxic water lacquer making the figure resistant to perspiration and saliva.